It’s very rare that I can’t decide quite which flora or fauna has soared above the rest in our weekly flower delivery. But here I am faced with two flowers that are new to our box, both very deserving of taking the top spot. So buckle up, flower lovers, you’re in for an explosion of colour, texture and down right quirkiness that’ll send your weekly flower delivery enjoyment sky high! Drum roll please for the joint winners of the week: Celosia and Mohican Allium. It’s not everyday that you come across a flower brighter than Barbie’s lipstick and shaped like your favourite firework. 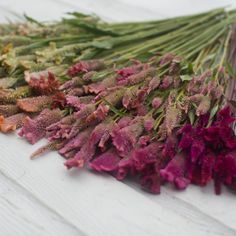 Celosia flowers come in all shapes, sizes and brilliant shades. There’s actually over 60 varieties. Celosia plants love sun and drought conditions. And, rather aptly, the word celosia translates as ‘dry’ or ‘burnt’ – helps you understand its origins and ignite the flaming rocket imagery, don’t you think? Celosia flowers are well known for their beauty. But guess what? Celosia leaves are a popular staple in Nigerian cuisine. The leaves are often used in stews in a similar way to how you’d use spinach. Pretty and practical! A little reminder – our celosia is for botanical beauty purposes so please don’t start stripping the leaves and popping them in your stews or side salads! Take your celosia to the next level, instead of eating it, try hanging it upside down for a couple of months. Celosia dries wonderfully, keeping its pop art-esque colour in tact. It’s the flame that never falters. You’re probably familiar with the allium. I’ve mentioned them before. The purple lollipop that’s part of the onion/leek/garlic family has a weird cousin with a punky haircut and an attitude to match. Stunning in deep crimson with tiny yellow heads, mohican alliums are the show pony of the family. Yes it will turn heads. No it won’t conform. Quite amusingly, an allium’s common name is ‘Ornamental onion’. Alliums sure are more aesthetically pleasing than your average white onion. Thank goodness for the ornamental variety then as I personally wouldn’t plonk an onion on my dresser. Most will think of the hairstyle. Correct. But the origins of the hair style? A Northern American tribe! Mohegan was their common language and the male tribesmen wore deer head top knots, similar to the mohican as we know it today. It was only in the 1950’s, once a film adaptation of James Fenimore Cooper’s 1826 novel The Last Mohicans was released, that the haircut was taken out of the tribal attributions and brought to the streets. So, the mohican haircut is a statement of the sole survivor of a noble race or kind. Find a more deeply thought provoking haircut and I’ll eat my ornamental onion! Solidago is a firm favourite of ours because it’s fluffy, vivid in colour and always reminds me of little sprinkles of sunshine. Or a sparkler. Either way you look at it, it’s a great addition to any arrangement! Your doorsteps were graced with magnificently mega gladioli for gladiators to use in battle a little while ago. Now you’ve got their younger siblings to stay! They may be endearing in size but they know how to work a room. Dot them around the edge of your vase to let their outward facing flowers show themselves off. I am, and always will be, a fan of foliage in our Freddie’s Flowers boxes. It’s my way of bringing the wilder side of flower arranging into the room. And this soft ruscus does exactly that! Soft in name, powerful in presence. Fuschia pink, deep red, yellow and green enough of an explosion for you? I hope so! There’s a lot going on in this bunch so let me offer a helping hand in my video on how to arrange this one. Feeling left out that you haven’t got a floral firework display of your own in your front room? Join the weekly flower delivery fun and give us a go for only £24 a pop!